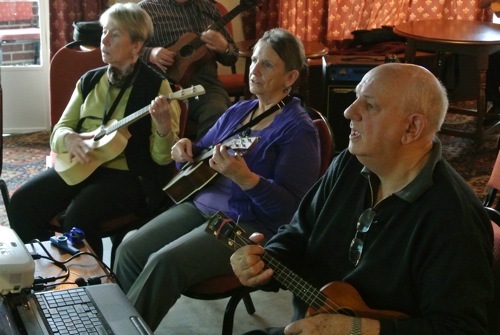 The ukulele group regularly has 40 to 50 attendees and sometimes even more. More of the members are willing to lead on the singing. We are grateful to now have regular bass and drum players which enhances the sound. Lessons for new players are still available. 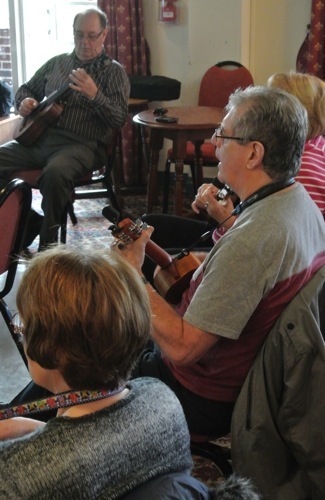 Until new members feel they wish to pursue things further we are in a position to loan out ukuleles for short periods, happily very few people fail to return. No need for music sheets or stands, as we project all the numbers onto a screen for us to play. Between sessions players are encouraged to practice at home for 20 -30 minutes per day, and within a short time are able to play the more simple tunes, as with most things the more you practice the better and more confident you become. The group meets weekly at Leigh Miners, on Mondays at 10:30am for a couple of hours.